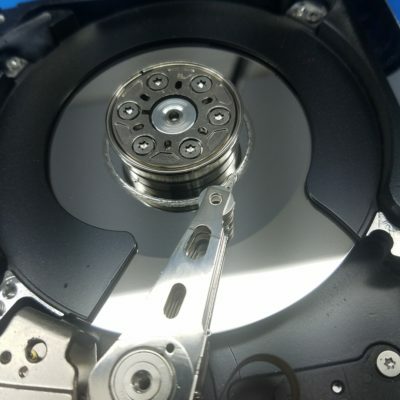 Aside from logical problems such as accidentally deleted files or damaged partition information, failures with mechanical/spinning hard drives can be generalized into 4 categories: multiple bad sectors, electrical failure, firmware corruption, and mechanical failure. 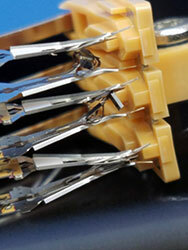 Due to normal wear & tear, all hard drives develop defects (or bad sectors) throughout their lives. Due to normal wear & tear, all hard drives develop defects (or bad sectors) throughout their lives. In a properly functioning drive, internal error processing detects problem areas and moves data from them to another location that has no defects. When this process breaks down, a drive and can become partially or completely inaccessible to a typical computer running a standard operating system. In cases where firmware or mechanical intervention is not required, data recovery can be achieved with specialized utilities which can issue commands directly to a drive without having to rely on an operating system "middle-man". Electrical failures typically involve the controller PCB on the back of a hard drive. Electrical failures typically involve the controller PCB on the back of a hard drive. Sometimes an electrical problem initiated at the PCB level can travel to the electrical components of the internal head stack, requiring a cleanroom-level recovery. Symptoms may include a "dead" drive (unable to spin up) or a burning electrical smell. Firmware is the internal operating system of a hard drive. Firmware is the internal operating system of a hard drive. Depending on the model, dozens or hundreds of firmware modules work together to constantly monitor, dictate, and control a drive's delicate mechanics and provide proper stabilization. Firmware corruption can cause a drive to not identify or to stay in a persistent busy state (among other things). These issues are typically resolved by using vendor-specific protocols and commands to manipulate the service area of the drive. Usually the initial corruption is caused by an underlying permanent problem, and firmware repairs provide a solution to restore sector access long enough for the purposes of data recovery. Mechanical failure relates to the malfunction of a drive's internal physical components. Mechanical failure relates to the malfunction of a drive's internal physical components. All mechanical failures (or problems caused by mechanical failures) can only be resolved by opening the drive and working with it in a particle-free cleanroom environment. Problems requiring this type of intervention can include bad or contaminated read/write heads, platter or spindle alignment problems, heads stuck to platters, heads jammed between parking ramp and platter edge, or media damage (scratches on platters). Probably the most obvious cause of mechanical failure is an impact, like a dropped external drive. Sometimes drives can just go bad with no warning; some of the worst cases are drives from a desktop that has never been moved. Symptoms of mechanical failure can include a clicking or knocking sound, buzzing or beeping, or a drive may even spin up, make no sounds at all, but not be recognized by a computer. Drive is functional but data is not accessible because of corrupt file system, missing partition information, or deletion of data either by accident or for any other reason. Some drives malfunctioning because of developing bad sectors or minor electrical problems also qualify for a Level 1 recovery. Drive malfunction is caused by a firmware failure, major electrical problem, or multiple bad sectors requiring extensive imaging time. Drive malfunction is caused by an internal mechanical problem and requires disassembly and intervention in a cleanroom environment. Some cases with major firmware damage also fall into this category. Devices that have been damaged by a previous recovery attempt or require custom-engineered solutions may receive a custom quote higher than Level 3 pricing. An example of this is the pictured drive: the heads have worn down the inner parking ring, resulting in a thick, visible layer of particulate coating most of the platter surface. Some Level 3 recoveries require donor parts. These parts are used to replace the failed components in the patient drive in order to (temporarily) repair the drive and allow data access. Donor parts must come from a fully-functional drive that is identical to the patient drive, and these drives are an expense to us. This cost is added to the recovery price, but only if the recovery is successful. Donor drives typically cost $75-$125.